Jane Austen once said, “There is nothing like staying at home for real comfort.” Well, true enough if there were no debts to pay. Sometimes, when the situation calls for drastic measures like selling the house, it’s going to be a bit emotionally difficult to get over with. However, if selling the house is going to make ends meet, then better name the price right. Whether you are looking for a house to live or the one selling the property with a real estate agent’s help, you have to know how to spot if the house is too pricey than it seems. Having an inaccurate price can result to no gains at all or, perhaps, to a waste of money. To help you spot an overpriced house, here are the most common signs to look out for. 1. Having a higher price than the neighbors The first sign of an overpriced house is the similar houses that are sold at lower prices within the area. How do you verify that information? Real estate agents can confirm the prices since can easily access the information. For more sources, you can also check online. It is definitely helpful to compare the prices of houses before finally deciding what price to put. Overpriced houses discourage the buyers who are looking for budget-friendly abodes. Whether you like it or not, the value of a house is usually dependent on the comparable houses that are sold within the residential area. If other homeowners in that certain area decide on lower prices than what you have in mind, the buyer might have second thoughts of purchasing your house. Compare and contrast. 2. Waiting for too long If you have been waiting for buyers for more than two months already and still no one is interested, then there must be something wrong with price you set. Although, this does not entirely apply on high-end properties since they can actually stay in the market for more than 12 months, interested clients should have appeared within the first four weeks if the price is appropriate. 3. Speaking of the economy Another factor to consider in pricing your house is the economy. Usually, the real estate market depends the pricing on the economy. When the market is a bit too low, it means that everyone is on a bumpy road and on a tight budget. When this happens, sellers tend to overprice the house just so they can get a fair price after a number of negotiations. However, overpricing can discourage some buyers who are better candidates to own your house. If it’s too complicated to do the computations, then it is better to consult an agent who knows how to adjust the pricing of the house based on the economy’s flow. 4. Considering the house location Most, if not all, real estate agents know that location of the property is an important aspect in putting a price on the property. 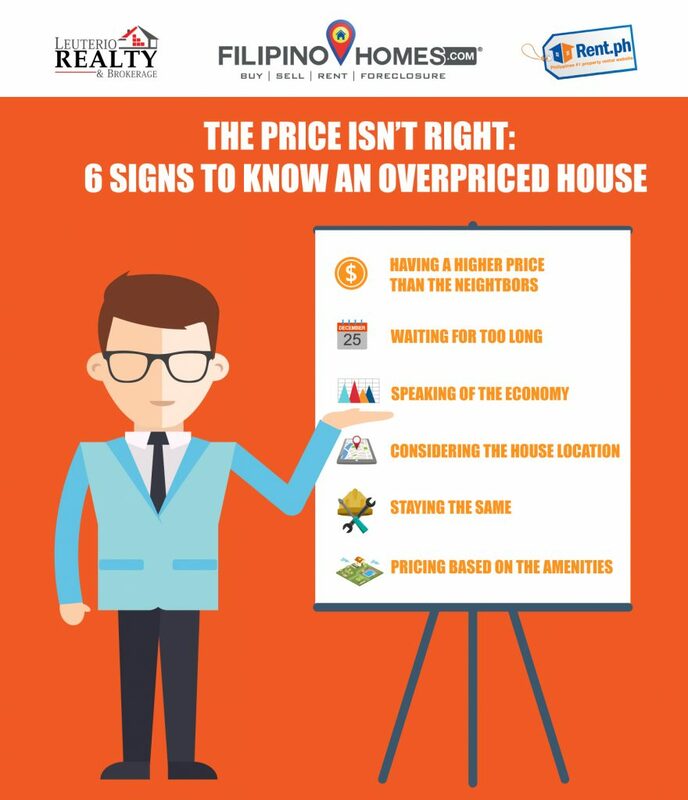 If you are the buyer of a house that is located far from establishments like school, malls and bank, it can already be a sign that the property may be overpriced. As much as possible, consider the location of the house before buying it. Check if the location has: – accessible roads with lights (for safety) – significant number of neighbors – access to police stations, supermarkets, schools, banks, etc. 5. Staying the same The house is usually overpriced when it has not been upgraded to look better and/or has low maintenance. If the buyer inspects and sees that there is a lot to be fixed and renovated, then the house fails to get the “I WANT TO BUY YOU” from the buyer. Having a lot of renovations means more money to spend. If you happen to be the seller of a house, always make sure that everything is fixed and upgraded to add value to the house. Make the price worthy to be appreciated and bought. 6. Pricing based on the amenities Just because you have a swimming pool or an indoor badminton court, it does not mean that you need to overprice the house. Some buyers don’t care about the amenities especially if they are not that interested in using those amenities. Just set an appropriate price based on the market of real estate, location, and condition of the house. These are the most common signs when a house is overpriced. But, it is not that difficult to see if the price is too high or not as long as you do your own research and price comparisons. 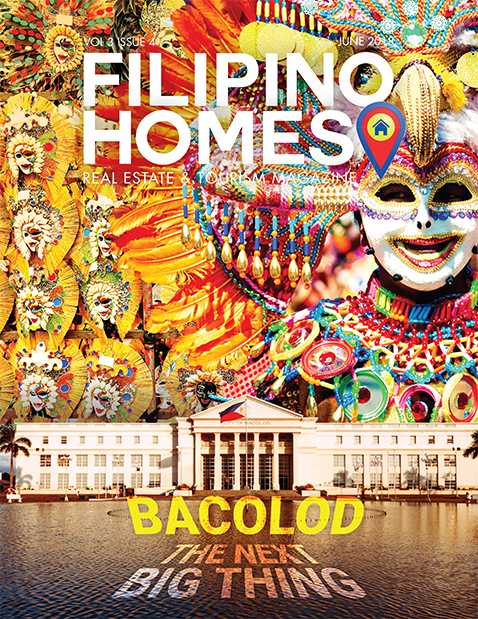 Precy Jane Cabugao is a REALTORS®, a PRC and HLURB Registered Real Estate Professional, and a Founding Member of Filipino Homes. She works as an online marketing director, social media manager, digital marketing trainer and consultant for Leuterio Realty and Brokerage. Why invest in Real Estate now, and not later?